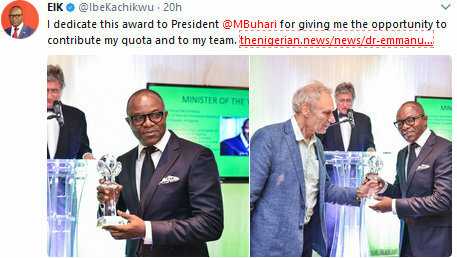 Nigeria's Minister of State for Petroleum, Ibe Kachikwu, has dedicated his award as " the 2017 Minister of the Year " to Nigeria's president, Pres. Buhari. I dedicate this award to President @MBuhari for giving me the opportunity to contribute my quota and to my team. He was given the award by a London based online portal, The Nigerian, for " his record-breaking and relieving contributions in transparency, accountability, probity, profitability and integrity in the management of Nigeria’s oil and gas resources".